Sure, the first half of the short track season wraps up with tonight’s Toyota Owners 400 at Richmond. However, that does not mean frayed tempers, pent up frustrations, and the old chrome horn are put to the side on a Saturday night. Rather, tonight’s round of Monster Energy NASCAR Cup Series racing means no holds barred action. Certainly, this is “The Action Track” that has the characteristics of short track and superspeedway racing all-in-one. Recently, Richmond Raceway could almost be renamed “Kyle Busch Raceway.” With six total wins at Richmond, including a sweep of 2018’s races, Busch appears to be the odds-on favorite for tonight. Ultimately, is it that easy to hand over the victory to Kyle Busch? Perhaps not. And that’s why we’ll see 400 laps of action at this 0.75-mile d-shaped track. Speaking of such, The Podium Finish’s columnists, Ashley Hobbs, Christina Bowman, Cody Shoppe, Jose Acero Jr, Kathleen Cassidy, Katie Coople, Kobe Lambeth, Matt Sisoler, Stephen Conley, and yours truly share varying thoughts on group qualifying and the competitive race last Sunday at Texas! 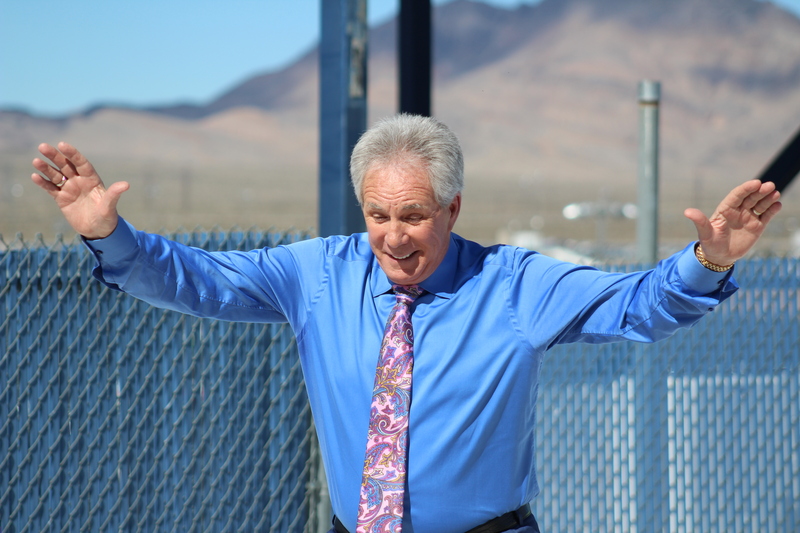 Darrell Waltrip recently announced that this will be his final season as a FOX NASCAR commentator. What has been his biggest contribution to NASCAR as a commentator and your favorite race with him in the booth? 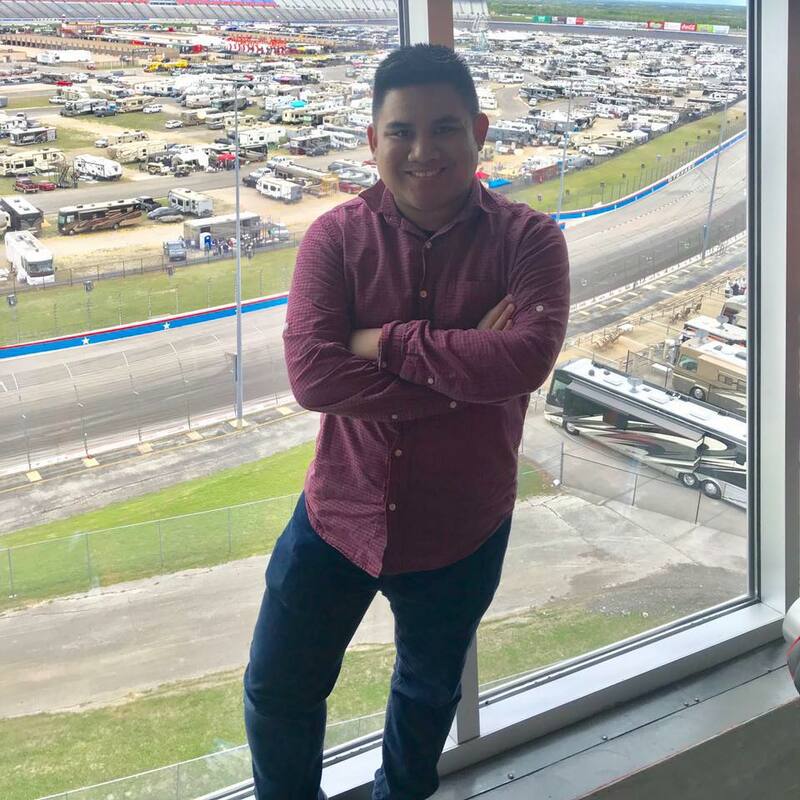 Acero : When I first started getting into NASCAR, I thought his oh, so famous “Boogity Boogity Boogity” was the coolest thing ever. But, it got boring. His biggest contribution to us, the public, I would say, is his ability to explain what is going on with a car at any given moments in simple terms. My favorite race with him in the booth would be the 2007 Daytona 500 when Kevin Harvick edged Mark Martin! Loved the passion behind it from DW! GRACIAS, DW! Conley : DW is a legend, a Hall of Famer ,and a champion. He brought something to this sport as a commentator that not many could. He brought the knowledge of old school racers with a different style to the booth and he interacted with everyone. Moreover, Waltrip gave the fans a comparison between old and new. As far as on track, I didn’t get to see him race much as his final win was in 1992. And, I didn’t see my first Cup race live until 1994 at Indianapolis where raced his way from the back to finish sixth that day. But, the two things I’ll always remember were out of the car. DW shaking Mike Joy in the booth at Daytona and him saying in 2001, “I hope Dale’s okay.” That will be stuck in my mind for eternity. Copple : Darrell Waltrip was the first broadcaster I really studied in the sport. His ability to describe what is happening on track or to a race car is something to be admired. He can take something that’s so technical and break it down in a way that my mother, who knows nothing about racing, could understand. He’s truly going to be missed in the booth. Lucas : 2001 was the beginning of a new era of motorsports broadcasting. The original FOX NASCAR broadcast changed the way we watched races all around. From the technical aspect of the sport, to our good ole’ boy broadcasters, it was great. But like everything in life, things get stale. The fanbase of NASCAR fans of the late 90’s/early 00’s have either had their favorite driver retire, or have lost total interest in the sport. Jeff Gordon was a great shot of adrenaline into FOX’s coverage in 2016, and gave hope to what the next generation of broadcasting could become. DW has been a great addition to the booth and will forever be Mr. Boogity Boogity Boogity for a generation of young fans. By far, my favorite call of his was the 2003 Spring Darlington finish between Ricky Craven and Kurt Busch. “They touch, they touch, Craven, he wins it! Have you ever? No, I’ve never!” Alas, it is time to hang up the headset and go enjoy the races Darrell, so we thank you! It seems like there’s that one racer who gets off to a hot start each season. This year, Kyle Busch has been nearly unstoppable. Might we see his winning ways continue at Richmond? Bowman : There is no doubt in my mind that Kyle Busch can win every week. Each track, just comes down to preparedness and a little luck. Cassidy : NASCAR fans should never count Kyle Busch out. 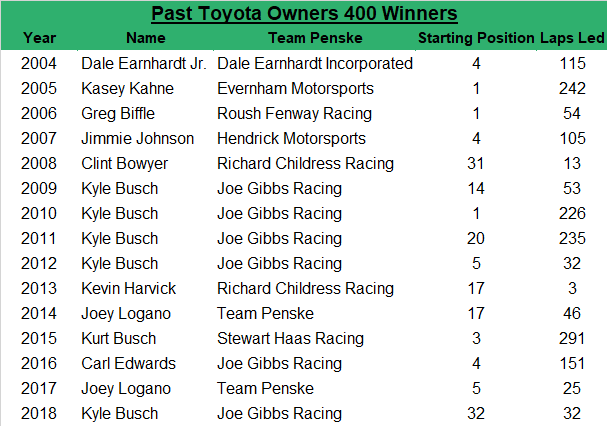 No matter if you like or dislike Kyle Busch he is one of the top drivers of this era, no doubt about that. Hobbs : It would be crazy not to think this. 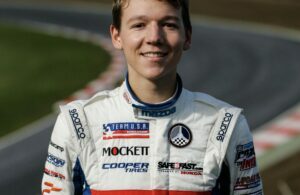 He is the defending race winner and the best driver thus far this season. It seems that the only stoppable force to Kyle Busch would be himself. Lambeth : There is a strong possibility that Kyle Busch could go to victory lane again this weekend in Richmond. It seems like Busch is continuing to get better year-after-year as a driver. I would not be surprised to see him click off an astonishing number of 10 wins or more. Shoppe : There hasn’t been a race all year yet that Kyle Busch hasn’t had a chance to win! With Richmond being the next race I don’t see this changing. Busch has two straight wins there and almost always has a shot to win the spring race there. As much as I would like to see a change of pace with who’s up front this year, there’s no reason to think this weekend’s race will be any different. 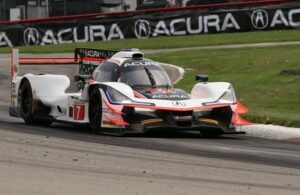 Sisoler : We might see it, although the Penske cars of Logano and Keselowski are seemingly taking over the other parts of ‘The Big Three” that MTJ and Harvick had. I’m not saying it won’t happen, but never count out Kyle Busch. Tiongson : We saw this with Martin Truex Jr in 2017 and it paid off handsomely with playoff points that aided him to that season’s championship. Last year, Kevin Harvick nearly duplicated this feat. Neither driver appeared to have a weakness in the early going but the competition did close the gap with both as the year progressed. 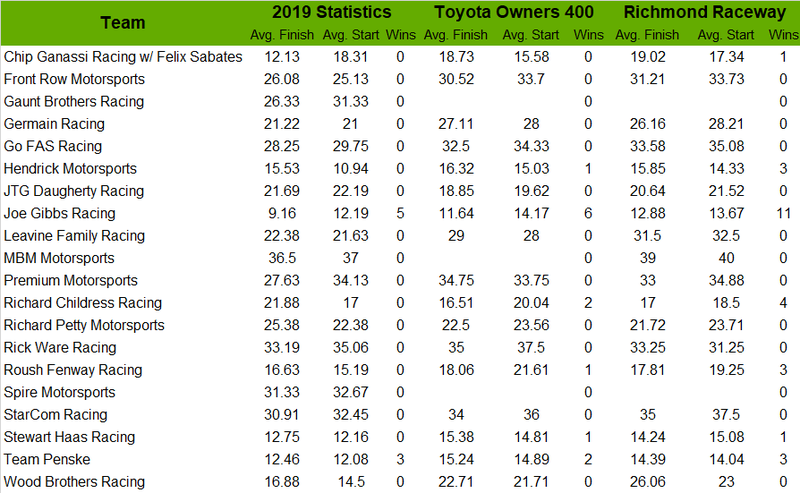 In this case, Kyle Busch and Joe Gibbs Racing have found that sweet spot for 2019. This package favors them. Furthermore, it could be that they’ve done their homework thanks to Busch’s participation in the NASCAR XFINITY Series and NASCAR Gander Outdoor Truck Series. Incredibly, we’ve gotten around Richmond in two laps without any fender damage! 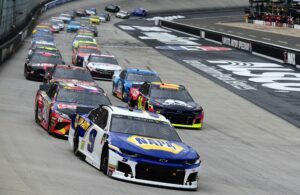 While we’re under yellow for debris, let’s review last Sunday’s action at Bristol with our race and points reports! Kyle Busch pleased a trio of our panelists at Bristol! In this case, a machine leads the way into Richmond! Some have wondered how TPF Stats projects the winner. Others have wondered if the machine has a bias. Never fear! Your questions are answered plus learn more about the stats and trends for Richmond! Here’s Ashley Hobbs who’ll be Crunching the Numbers: Richmond style! Historically, Richmond has been kind to Hendrick Motorsports. Remarkably, Logano leads the past Cup champs at Richmond.qRemarkably, Logano leads the past Cup champs at Richmond. Now, here are your Richmond race trends since 2004. Presently, here’s the trends at Richmond in the past 10 spring races. Lastly, here’s the trends at Richmond’s spring event in the past five races. Please don’t tell us you’re surprised. You’ve attended the Trending Topics and Crunching the Numbers: Richmond symposiums. Now, it’s time to put this knowledge to the test with winning time! 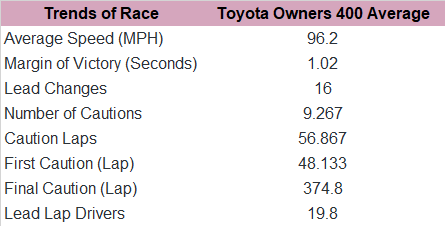 Here’s our picks for tonight’s Toyota Owners 400 at Richmond. 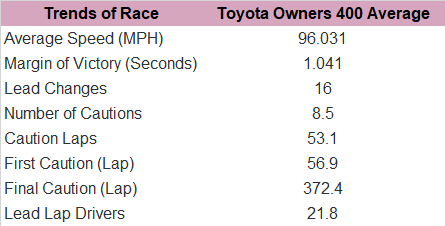 Ultimately, Kyle Busch has some formidable competition for tonight’s Toyota Owners 400 at Richmond! Copple : Kyle Busch is on a roll. It’s hard not to pick him for this race. Hobbs : As the defending race winner and most recent winner this season, I don’t see the forces stopping Kyle Busch just yet. Lucas : The bearded M&M’s will grace victory lane again. Kyle Busch is on a roll, so why stop now? 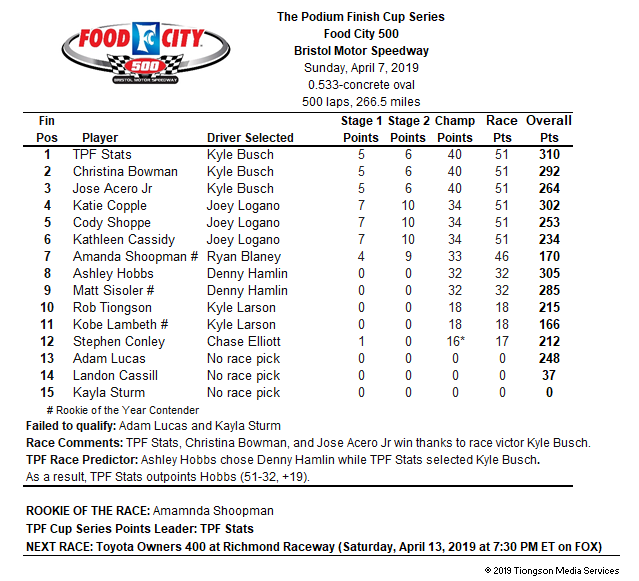 Tiongson : Look for a bearded Kyle Busch to win his fourth race of the year and perhaps in what may be as dominant of a race performance as we’ve ever seen at Richmond! 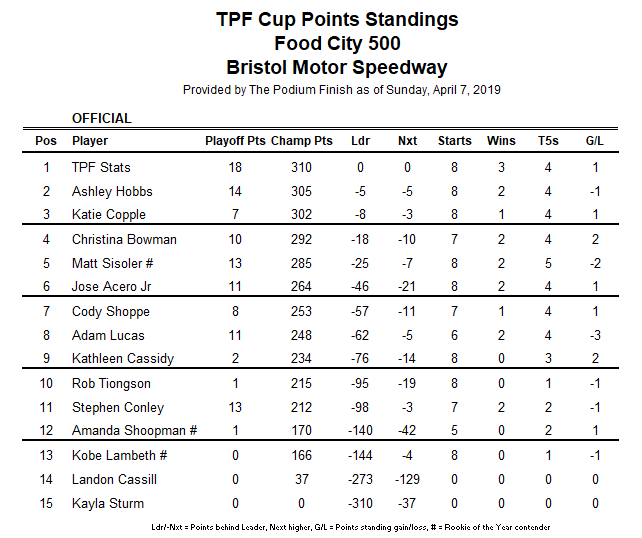 TPF Stats : Wait for it as this is going to be a shock – Kyle Busch to victory lane for the fourth time this season! 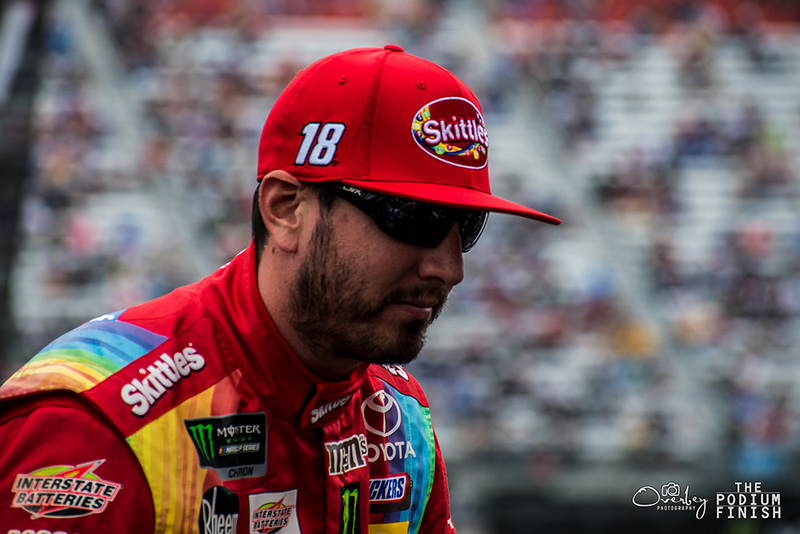 Sisoler : I am thinking Kyle Busch is a strong pick, but will he win again at Richmond? I don’t know, and so I am going to pick against him again, and hopefully it works (shrugs). It’s going to be Joey Logano winning at Richmond! Conley : Team Penske or Joe Gibbs Racing. I have to go with Brad Keselowski to keep that trend going this week. Lambeth : There is going to be a Busch in victory lane. But, it is not the one that you were thinking about. 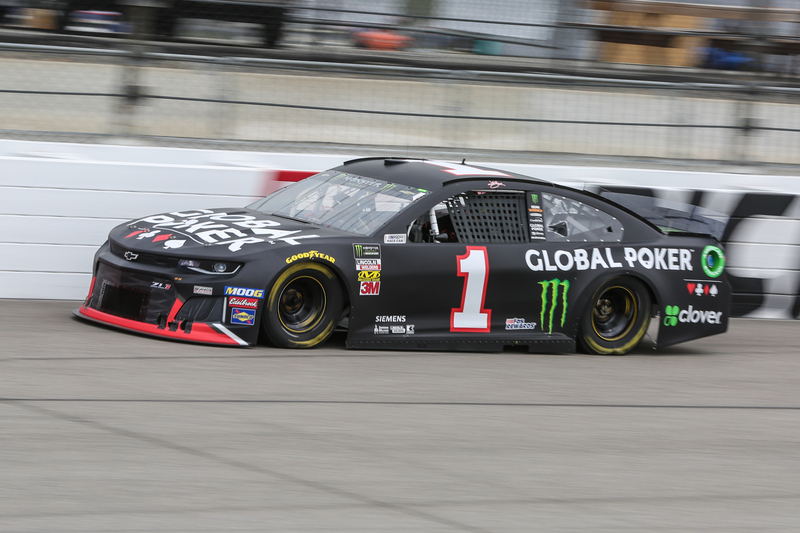 Kurt Busch is finally going to get his turn and get Chip Ganassi Racing back in the winner’s circle. Shoppe : While everyone is looking at Kyle Busch to win again, I’m not counting out Kevin Harvick. Let’s not forget who was this dominant last year and has a pretty good Richmond record as well! Race fans, thanks for joining us for our preview of the Toyota Owners 400! We’re ready for some racing. How about you? What do you think are the biggest storylines heading into Saturday night’s race and who is your favorite to win? Tweet us now @ThePodiumFinish and tell us now! Thanks as always to the TPF team for their amazing efforts this week! We hope to see you at the races in 2019. The opinions and thoughts expressed in Podium Preview are solely of the authors. They do not reflect any organizations affiliated with the participants and author outside of TPF. This weekly feature is strictly for entertainment purposes and are not indicative of TPF, the organization, and its staff.